I’ve written quite a bit about how much I like drying food from the garden rather than canning. Which is a hot and expensive way of preserving things. But this time of year my handy-dandy home-made solar dryer is fairly useless, there’s just not enough hours of sun to make it work. So I use the oven, which can also be a relatively expensive proposition. Still, good craisins are expensive from the store in those little brand name bags, so it works out fairly. Even better, if you make your own craisins at home you can do some pretty spectacular things with them flavor-wise. This year I’m doing the “Double-Dry” method for orange flavored craisins. 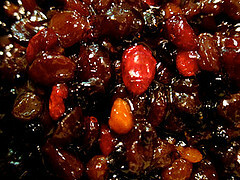 It’s easy enough – just dry the craisins in single layers on flat baking sheets in a barely warm oven – I use the lowest setting, 150º – and keep the door propped open a couple of inches to allow the moisture to escape in natural convection. Takes awhile, and many of the berries retain their size and shape until they’ve cooled completely and wrinkle up into the ‘usual’ raisin-like form. I put these into a glass bowl and cover them with hot orange juice. Then cover the bowl and let the berries reconstitute. Then dry them again. You could use any type of fruit juice to flavor your craisins, even wine or brandy if you want. Just be sure to label the containers you put them in so they don’t get mixed up. They are wonderful additions to holiday cakes, breads and cookies, or just as handy snacks. If you want your craisins to be sweeter, just thoroughly dissolve a tablespoon or two of sugar or honey in the reconstituting juice, it will get absorbed. It’s cranberries this time of year, but drying and double-drying fresh fruit works any time of year, whenever the local harvest has big lots at the farmer’s market. I haven’t yet double-dried apples, as dried apple slices go so fast as snacks around here that it seems the hoards just stand around drooling to get them as fast as they can be produced. But if ever I did happen to have dried enough for, say, a Thanksgiving pie, I’d probably reconstitute them in spiced juice (mulled cider or even wine) just before putting them into the pie crust, using leftover juice as part of the filling. Just add sugar and corn starch to thicken. Cranberries don’t grow in my locale, but blueberries sure do. I’m planning to dedicate several terraces on the upper yard slope to the ridge to blueberries, once I find a good source of thinned bushes I can get for free. Say, 4 100-foot rows of good producers, which works out to ~25 bushes per row spaced at 4′. Good producers will return ~5 pounds of berries per bush (some will give 10, but I’m being conservative here). Once they’re producing at that level, I’ll be getting an average crop of 500 pounds a year! That’s big enough to supply my family and friends as well as the local munchy market. Besides, blueberries come in high summer, which would let me use the sun instead of expensive electricity to do the drying.